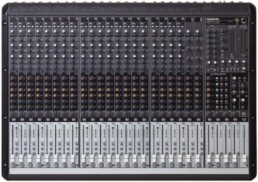 The 16-channel 1640i is the flagship mixer of the series featuring a full 16 mono mic/line channels each with 4-band dual sweep Perkins EQ, a whopping six aux sends each with pre/post and solo capability, 4 sub groups and a powerful master section. 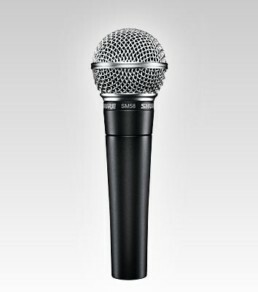 Despite its large channel count, the 1640i is compact, rack mountable and features our renowned flexible RotoPod™ design, allowing the mixer to be housed in any configuration – from custom studio furniture, live sound installs or even post production machine rooms. 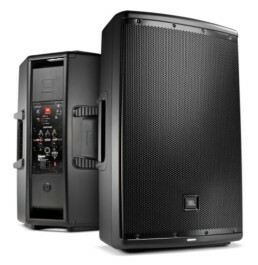 The 1640i’s full-featured 16×16 FireWire capability allows the user to route all channels, aux sends, sub groups and master L/R to their favorite DAW. 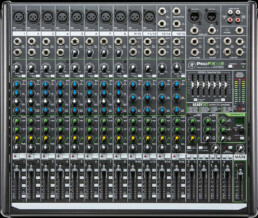 However, the true power of the 1640i lies in its ability bring back the full 16 channels of FireWire output from your computer directly into the channel strips – for a true tape style mix down. The Onyx 1640i is the flagship mixer of the series, boasting a full 16×16 FireWire interface, allowing for something that a DAW could never do alone: A true tape-style mixdown. 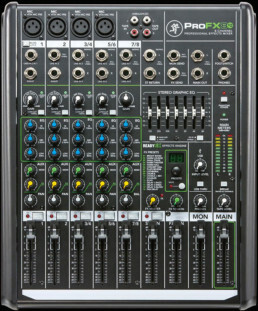 If you are doing a real analog mixdown, you will surely benefit from the premium features that the 1640i provides. Send all channels simultaneously to your DAW, get them recorded and apply your plug-ins. Once you have everything edited and ready, you can simply route up to 16 streams straight back into the 1640i’s channel strips. You can choose to apply some of that lovely Perkins EQ if you wish. All of these signals hit our premium, high-headroom custom summing bus. 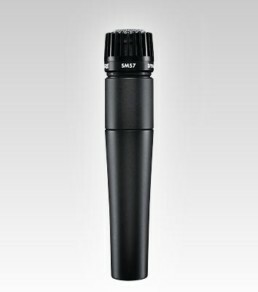 It combines the best of both the digital and analog realm to create seamless workflow that makes your sessions faster, easier and better sounding than ever possible before. Wet or Dry? — Every channel on the mixer can be routed pre or post EQ to the computer, allowing you to choose whether to implement ‘EQ to tape’ or not. Studio Quality Effects—All aux sends are routable to the computer, allowing you to utilize your computer as a powerful FX engine by implementing your favorite plug-ins in a live scenario. Preserve Your Mix — Master L/R is routable to the computer for recording your analog mix. Burn and sell CDs of the mix at the end of the gig! 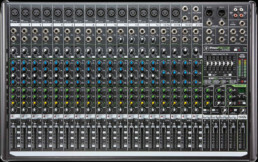 Mix Integration — Up to 16 sources from your computer can be routed to either the control room for instant monitoring or right back into the channel strips for mix integration. 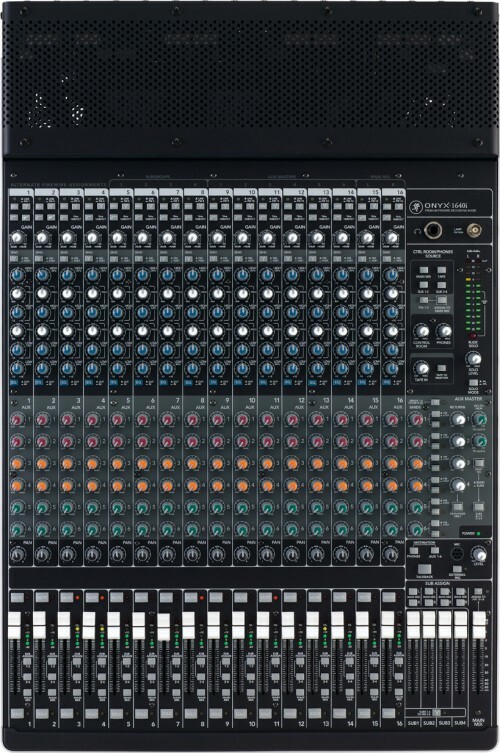 Latency-Free Overdubs — Having a “real” mixer has its benefits. Latency-free overdubs are simple since you are using an analog mixer. 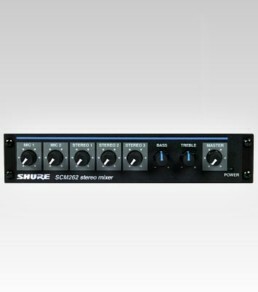 No more wasted time dealing with the complicated “DSP” mixers commonly used on standalone interfaces. Built-in DI on first two channels for direct connection of guitars, bass, etc.